The AME BARI 6039 and AME BARI 6048 is a portable low air loss mattress replacement system designed to provide therapeutic benefit to patients suffering from, or at risk of, developing pressure ulcers. The system is unique in that it can also provide on-demand alternating low pressure therapy, should it be desired. The system, consisting of a Control Unit, an Air Flotation Mattress and a therapeutic Top Sheet and is designed to provide pressure management therapy and patient comfort. 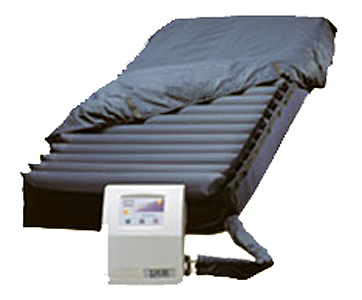 The Control Unit inflates and maintains the Mattress to user-selected settings, and can also provide on demand alternating low pressure therapy if desired. Used with the Auto Aire Select or Aire Select Safety Mattress with the Sensor Cell Option with their Active Sensor Technology, the system automatically adjusts the Mattress to the optimal fill level insuring complete flotation therapy. The AME BARI 6039 and AME BARI 6048 consists of twenty transverse air cushions constructed of low sheer nylon. Each cell is a minimum of over eight inches tall (inflated height) and located above a two inch convoluted foam base. The material used in their construction is a low shear nylon which aids in reducing the chance of skin breakdown. The air cushions are designed with orifices to provide continuous low air loss to aid in the prevention of skin maceration. The Aire Select™ Safety Mattress features two side bolster options to allow the patient to safely immerse into the mattress. The first option is a straight bolster version which rises three inches above the mattress. An Egress option is also available. 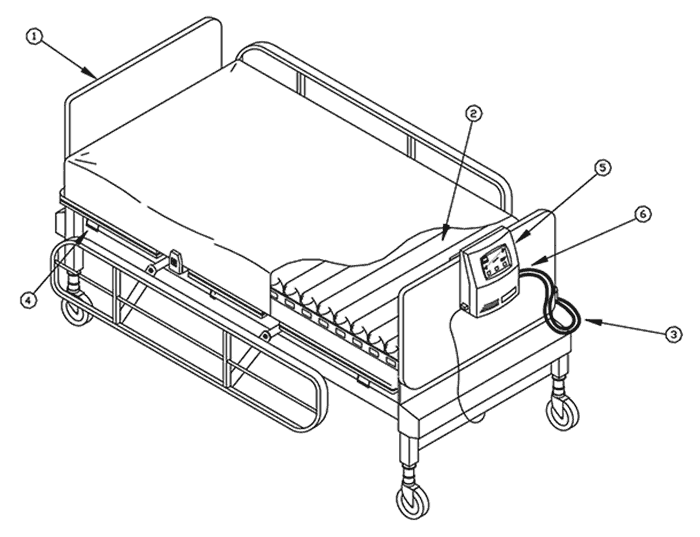 The Egress option also rises three inches above the mattress but also features a three inch drop in the middle of the side bolster to aide with the egress and ingress of the patient from the mattress. Covering the entire Aire Select Safety Mattress assembly is a low-friction, low-shear producing, vapor permeable, nylon top sheet. The top sheet surface creates a membrane impermeable to liquids, air and bacteria though still permeable to water vapor. Quilted onto the base of the Mattress top sheet is a spun bonded polyester fiberfill that exhibits less frictional resistance to nylon than that of the patient’s skin. When the patient moves, the top sheet tends to move relative to the air cells rather than relative to the patient, minimizing shearing effects. Additionally, the quilting acts to provide a diffusion layer by which the water vapor can be drawn away from the patient, resulting in more efficient evaporation and subsequent reduced skin maceration. Bariatric low air loss and alternating pressure mattress system. 20 nylon-coated, 8” high air cells provide full immersion and envelope the patient. Available in 39” Width (AME 6039); or 48” Width (AME 6048). Waterproof, breathable high quality nylon top cover reduces friction and shear. Low air loss delivered at 100 liters per minute. Alternating pressure cycles air every 5 minutes between A/B Cells. User friendly control unit allows for easy comfort control of soft/firmness. Max inflate allows the mattress to inflate in seconds. 2” foam base adds safety and comfort. CPR quick release for rapid deflation. Optional raised safety perimeter with egress openings for fall prevention. Used to turn the system on and off. The amber LED indicates the unit is in standby mode. The green LED indicates the unit is in normal running mode. The soft button is used to decrease the pressure in the mattress, and the firm button is used to increase the pressure in the mattress, with a range between approximately 10mmHg and 32mmHg max. Nine pressure settings are available to enable the user to select the lowest possible pressure that will still support the patient. An LED panel reminds the caregiver of the system settings that are correct for their patient. 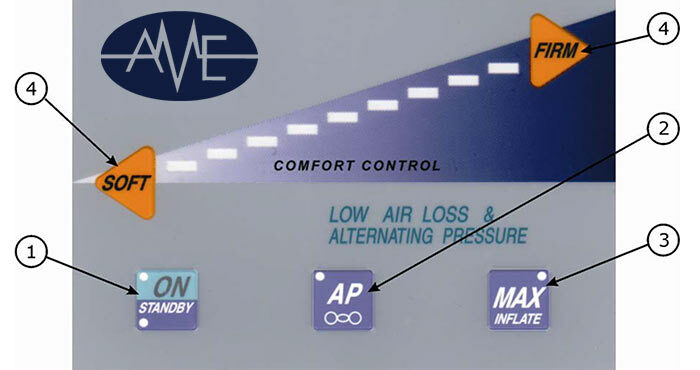 The air mattress can be maximally inflated (32mmHg) by pushing the “MAX INFLATE” button on the control unit, to assist in patient ingress/egress as well as normal nursing procedures. Upon initiating the maximum inflate condition, the mattress will rapidly inflate to its highest (firmest) level and maintain that setting. “MAX INFLATE” button will remain illuminated while system is in maximum inflation mode. If the “MAX INFLATE” button is pushed during max inflation mode, the button will cease illuminating and the system will return to previously chosen settings. After 30 minutes in the “MAX INFLATE” mode, the system is programmed to automatically return to the therapeutic settings. This fail-safe feature prevents a high-risk patient from inadvertently being left on a firmer than therapeutic surface. A simple push of a button on the control unit transforms the Plexus Aire Select system from a low air loss therapy system to one that provides alternating pressure therapy. 1. Place mattress (2) onto the bed frame. Make sure to orient mattress so the air tubing (3) exits the mattress at the foot of the bed. 2. Before securing the mattress straps, raise the head and foot ends of the bed frame. Raise the side rails. Loosely, secure mattress to bed frame by looping the nylon straps on mattress through the bed frame and then back through the D-rings on mattress. Make sure the side rails can still move up and down without interference. 3. If you do not have an Aire Select Safety Mattress, skip to step 4. Otherwise, lower the side rails down and unzip the side bolster pockets, locate the longer of the two bolster ends at the head section and slide the bolster into the pocket. Zip the pocket closed. Repeat on the opposite side. Plexus mattresses are not intended to be AND DO NOT FUNTION AS a patient fall safety device. SIDE RAILS MUST BE USED WITH THE PLEXUS MATTRESS TO HELP PREVENT FALLS, unless determined unnecessary based on the facility protocol or the patient’s medical needs as determined by the facility, IN WHICH CASE THE USE OF OTHER SUITABLE PATIENT SAFETY MEASURES ARE RECOMMENDED. 5. Connect the free end of the tubing (3) to the respective mating connector located on the side of the pump (6). This “quick connect” fitting can be secured by simply mating the two ends together in a linear but opposing direction. 6. Check that the hose is secure by gently pulling. Ensure the air hose is not kinked or tucked under the mattress. 7. Cover Aire Select air mattress with the PLEXUS top sheet and attach to the mattress Drings provided. Cover the mattress with the therapeutic, low-shear top sheet and attach to the mattress by looping the Velcro straps on the top sheet through the D-rings on the mattress. In the case of the Aire Select Safety Mattress, zippers located on all four sides attach the top sheet. Verify top sheet is loosely fit so as not to “hammock” patient above mattress. 8. Plug power cord into a properly grounded outlet. Unit will enter “STAND BY” mode. Apply hospital linens and/or incontinence pad over the top of the Mattress. Linens should be loose to prevent “hammocking”. 9. To enter normal operation mode press ON/STANDBY switch on the control panel. 10. Place patient on the air mattress and position along center of bed. (Note: The control unit can inflate the mattress with the patient laying on it.) For quicker inflation, or to assist in patient ingress/egress as well as normal nursing procedure, MAX INFLATE can be activated. Raise the bed side rails.